Let’s play Wits & Wagers! How many words are in this post? If you’ve been to our house in the past few weeks, you’ve probably been asked if you want to play Wits & Wagers. 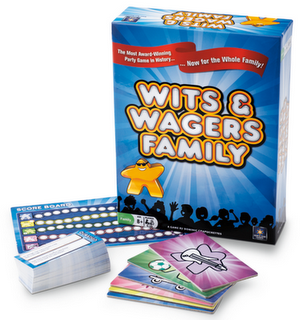 We actually have Wits & Wagers Family, the family friendly version of the original game. It was given to me, and several of my mates, by North Star Games, to review as part of The Old Schoolhouse (R) Homeschool crew. This is a question and answer game, but…you don’t have to know the answer. Another reason my 6 y.o. and I think this is “the best game ever!” The game comes with 300 questions, 5 dry erase (answer) boards and 5 dry erase pens, 1 dry erase score board; 5 large and 5 small Meeples (wooden markers). We are actually considering customizing our Meeples. First person or team to accumulate 15 pts. wins the game! Questions vary, but every answer is a number. You might get, “How many different colors of Froot Loops are there?” or “In feet, how tall is the world’s largest IMAX movie screen?” I happen to know there are 6 Froot Loop colors, but the IMAX answer would be a total guess. I might not know the answers, but I can still win, if I choose the right answer or the one closest to it, without going over it. Wits & Wagers Family game is $19.95, available from North Star Games, at BarnesandNoble.com, and other retail locations where board games are sold. I have yet another reason why this is “the best game ever!” It’s adaptability to our homeschool. I can make up questions, with number answers, to correlate and reinforce any subject we are studying. Learning is fun! and this game proves it. Even if, I only use the 300 questions that come with Wits & Wagers Family it is impossible to not learn something every time we play. 511 words in this post. I have six grandkids age 10 and under, and I came *this close* to buying this game at Christmas. Now I wish I had! I love your idea of making up questions to help teach facts about things with numbers. I have six grands, age 10 and under, too. Our newest was born on Christmas Eve day, 2010. Don’t you just love grand babies! You may be more familiar with me from boardgamegeek.com, where I am a prolific reviewer posting under the handle EndersGame. My pictures posted on boardgamegeek.com are all copyright, and may only be used on that website. Not everyone is aware of this, but in fact this is the case for most photos posted on boardgamegeek (not only mine). They can only be used elsewhere if permission is asked from and granted by the photographer – which in this case is me. In this case I was not asked for permission. If you don’t find this acceptable, then please remove the image. Please let me know when you have either removed the image, or included proper attribution as requested. I look forward to hearing from you soon. And best wishes for your ongoing efforts with your blog! Wits & Wagers Family is a great game, and I’m glad you gave it some positive exposure. By all means please delete this message after reading it – I only posted a comment this way because using your contact form didn’t work, and I couldn’t find your email address. To other readers: I highly recommend this game! Thank you for such a polite comment addressing copyright infringement. I have removed your photo from my blog and I hope you will accept my apology for using it without your permission. I have several photos on my blog that I do not want used without my express written permission; so, I completely understand. In my defense, I absolutely did NOT know it was your photo. I obtained it from our company’s Photobucket account, believing it was put there by a crew member for everyone’s use. I know it has been taken off of the Photobucket account now, as well. I appreciate the information about my contact form and email address. I’m still rather new to blogging, but hopefully I will be able to rectify the problem, soon.